I was recently given an opportunity to have my son review a book, and I chose Hate List by Jennifer Brown as the book I'd like him to review. Why? Because alot of times, young adults make choices without fully realizing the consequences of their actions, and this is one of those books that teaches a lesson. We are readers in our house; I started my kids out reading from babies. I love to read and so do they, so anytime we're given the opportunity to review a book, I tend to jump at it! We love all types of books, from fiction to non-fiction. I wanted a book that would keep him interested (he does love to read but who wants to read a book with no storyline, or one that is all over the place?) as well as teach him something. I hope that this book accomplished that mission. I had my son tell me 5 descriptive words about this book and he said the book was: good, engaging, interesting, informative, and full of suspense. He said he thoroughly enjoyed this book and couldn't put it down! 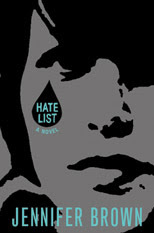 You can currently buy Hate List at Amazon.com and at BN.com. Thanks to The Classy Closet and Little Brown Books for this review opportunity! It's nice you get to spend book reviewing with your son. I don't know that many children who likes to read books. And this particular number looks dark.